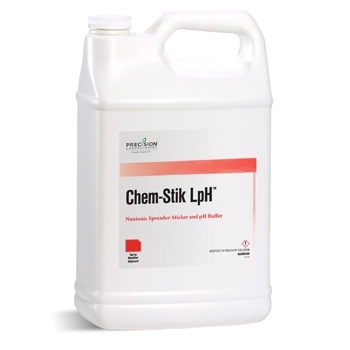 A unique non-ionic spreader-sticker formulated to protect crop protection products from premature chemical breakdown by buffering the spray solution to a slightly acidic pH level of 5.0 to 6.0. Start with a 16 oz use rate and verify that desired pH level has been achieved. If needed, continue adding in 8 oz increments. 16-48 oz/100 gal of spray solution.